MALVERN, Ark. (KTHV) - If you visit Malvern and ask the locals for a good place to eat, chances are, they'll point you in the direction of Keeney's. It's a place with deep roots in the community where everyone knows your name. During lunchtime at CK Keeney's restaurant in Malvern, the menu is just as full as the restaurant. "We make this gravy from scratch in a skillet." Locals know this is a great place to get a down-home meal, at a bargain price. Keeney's feeds as many as 150 people for lunch in a small space. If you call Keeney's to place a to-go order like so many in Malvern do, you'll probably speak with Maureen, CK's wife of 60 years. She keeps the store running by bagging orders, counting change, and sending customers on their way with her small-town charm. 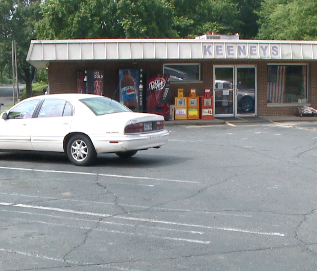 But before CK and Maureen opened the restaurant, they only had Keeney's Food Market. Business boomed, until several decades later when Walmart came to town. "We went broke like the rest of them little ones. Time changed on us." In the year 2000, CK Keeney changed with the times to save his business. "When I turned 65, we started cookin'." It started with BBQ and a smoker out back, but he quickly realized the potential of a restaurant. "We had $45,000 to retire on, so we went to town and borrowed $45 more and spent it back there on the kitchen." It was a fresh new beginning for Keeney's as the food market shrank, the restaurant grew. They started with only 36 seats, and that quickly doubled to 76 seats. Now, the restaurant is filled with customers new and old. From personal collections in the store, to pictures of neighborhood kids on the wall, it's hard not to feel at home there. But after 60 years of running things, CK knows he's not getting any younger. "I'll be 80 in December…my knees are worn out." But there is one thing that makes him feel young again. "We bought a '06 Corvette convertible. Red, burgundy." So for now, Keeney's remains Malvern's hidden gem. It's a little piece of American heaven at the corner of Dyer and Mill. Keeney's is open from 6 a.m. to 6 p.m. Monday through Friday, and from 6 to 3 on Saturdays.